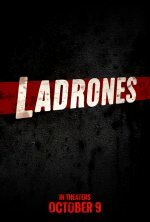 Ladrones release date was Friday, October 9, 2015. This was a Limited in theaters release. Following a successful heist, modern day Robin Hoods Alejandro Toledo (Fernando Colunga) and Emilio Sánchez (Miguel Varoni) leave their lives of crime for a more civilian life. Ladrones sees Toledo return to his do-gooder robbing roots, and although Sanchez can’t quite commit to helping out, he introduces Toledo to the hilariously skilled Santiago Guzmán (Eduardo Yáñez) to help him with the mission of a lifetime. The two must work to reclaim land stolen from a hard working community by a ruthless family of crooks led by a beautiful but lethal diva.